Happy Sunday everyone. 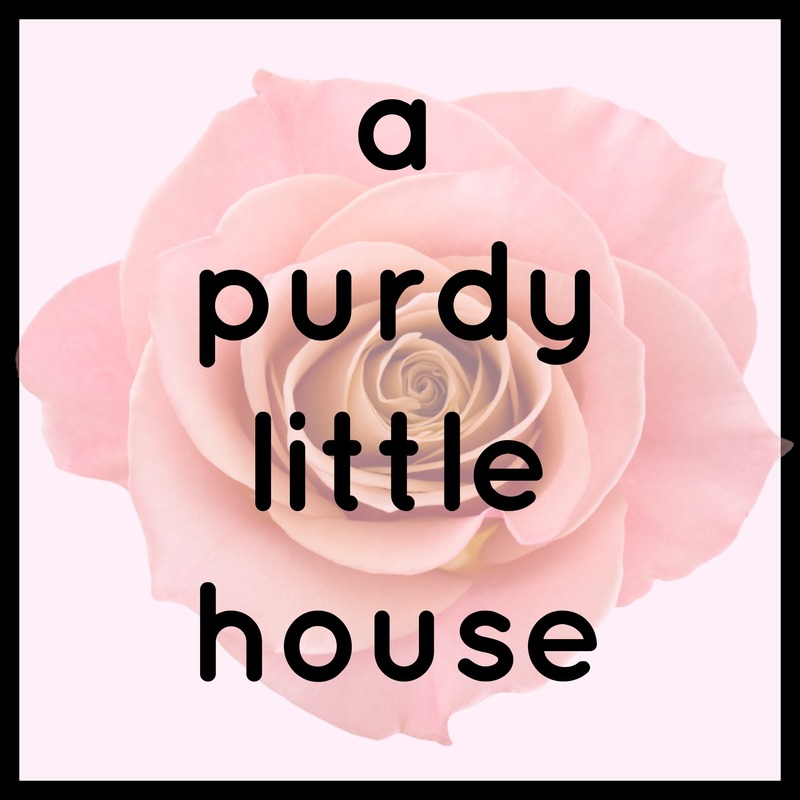 My blog post today is all about creating (cheap) outdoor decor for my porch. I love my porch, and it’s one of the main reasons we bought our house. It’s nice to sit out there with a cup of tea, and wave hello to passers by. The only thing it was missing was some type of wall decor; something to break up the boring brick. 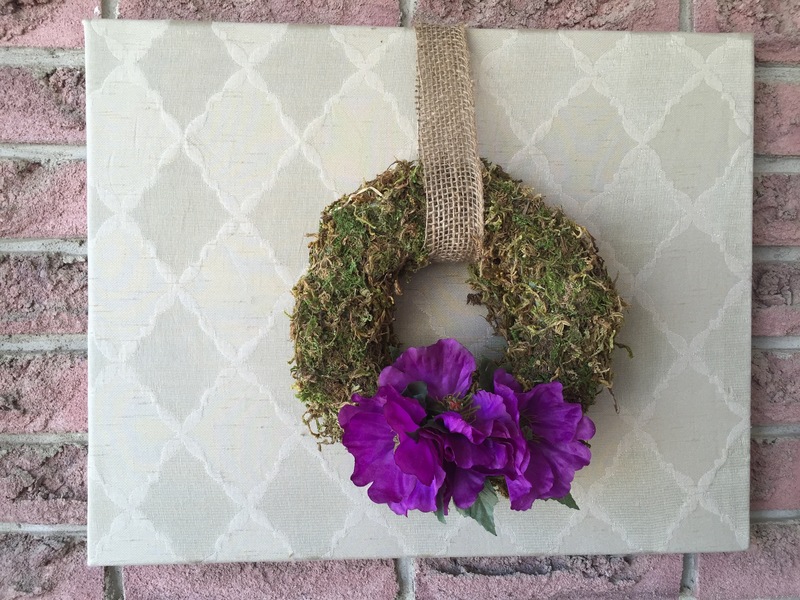 I love three dimensional artwork, so I decided to create a background on canvas, and add a wreath of some sort. Since my porch is covered, and the items on the brick wall won’t be exposed to the elements, I went with regular fabric. If I was going to be putting these in my backyard, I would have to use outdoor fabric. 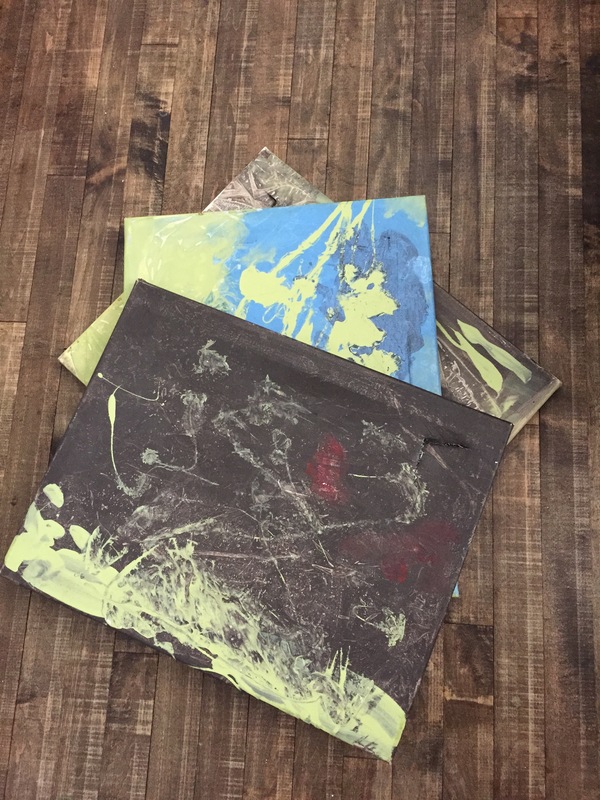 I had some old canvases lying around in my garage from years ago, when I tried to do some abstract art (don’t laugh). Pretty terrible though, huh? I know…. So that’s why I didn’t mind one bit the thought of covering these canvases with something pretty. 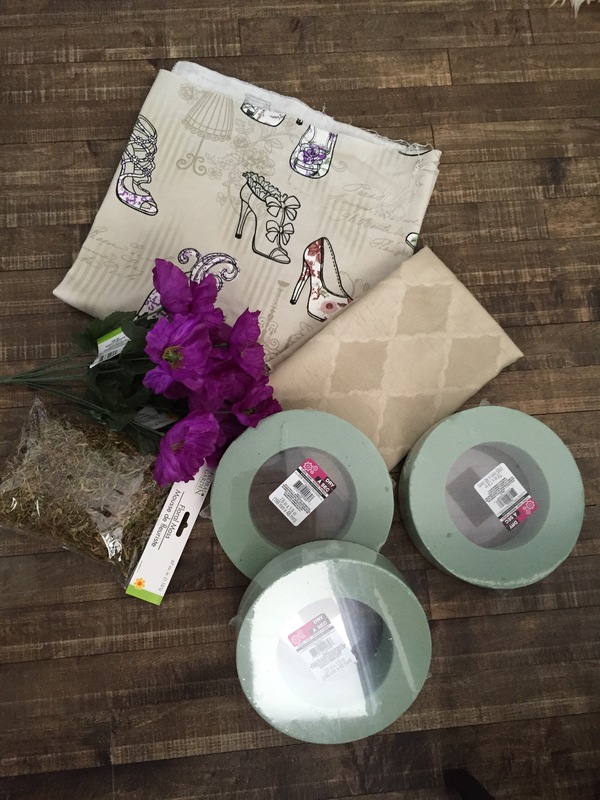 I went to Fabricland, where I was able to pick up two half meters of pretty fabric for under $10.00. I also picked up three floral foam circles, some faux purple flowers and moss (since I’m on a moss-covering kick at the moment). 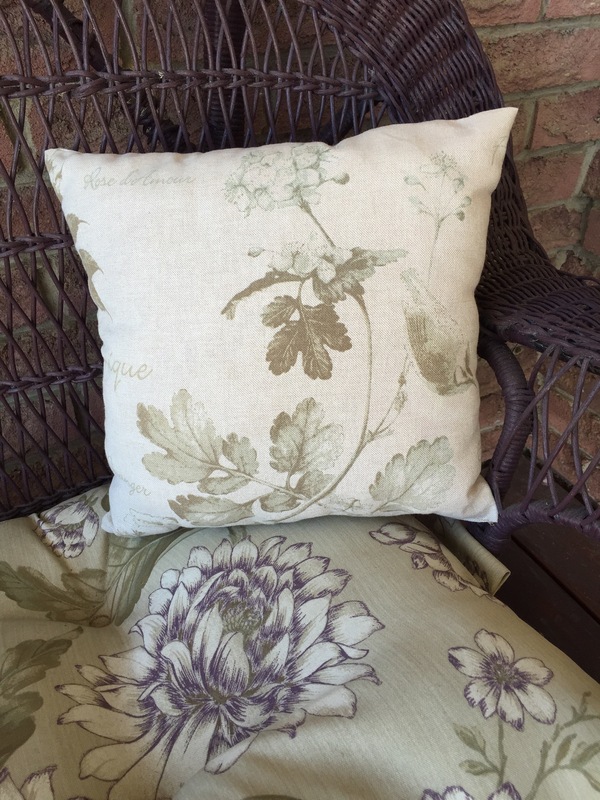 I wanted to find a fabric that fit in with the tones of my porch furniture cushions. Here is a close up of the taupe, deep purple, and mossy green colours. 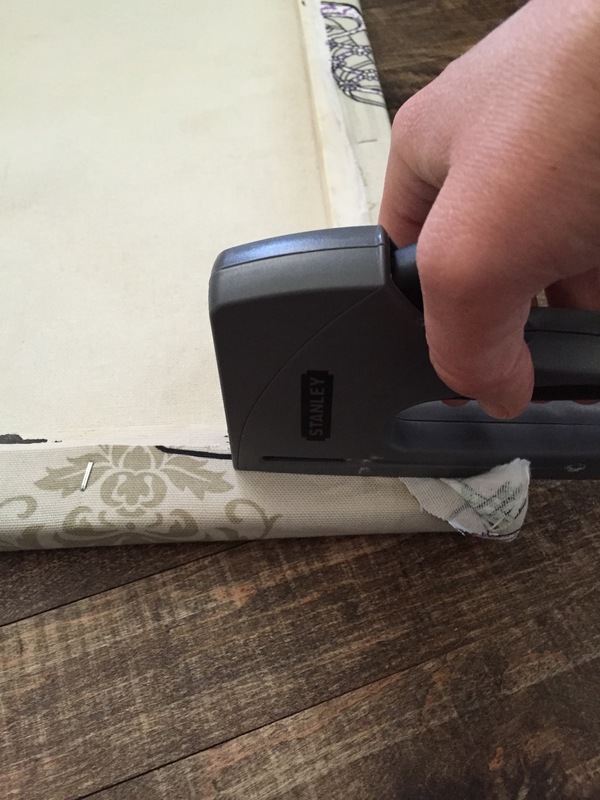 I cut the fabric to size, and used my staplegun to secure it to the canvas. 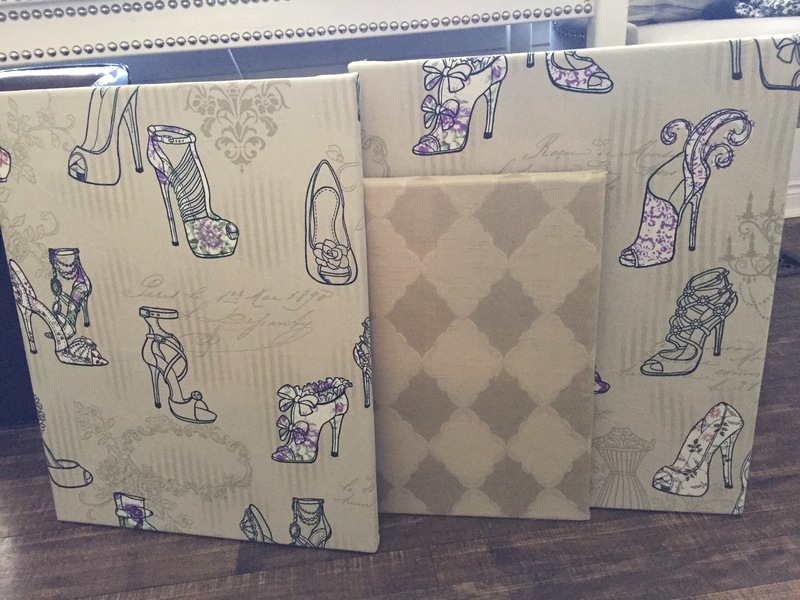 Here are the three completed canvases. Isn’t that shoe fabric just so pretty?????? I love it, and I even toyed around with the idea of ditching the outdoor decor idea, and hanging these on my wall inside. But, I perservered. 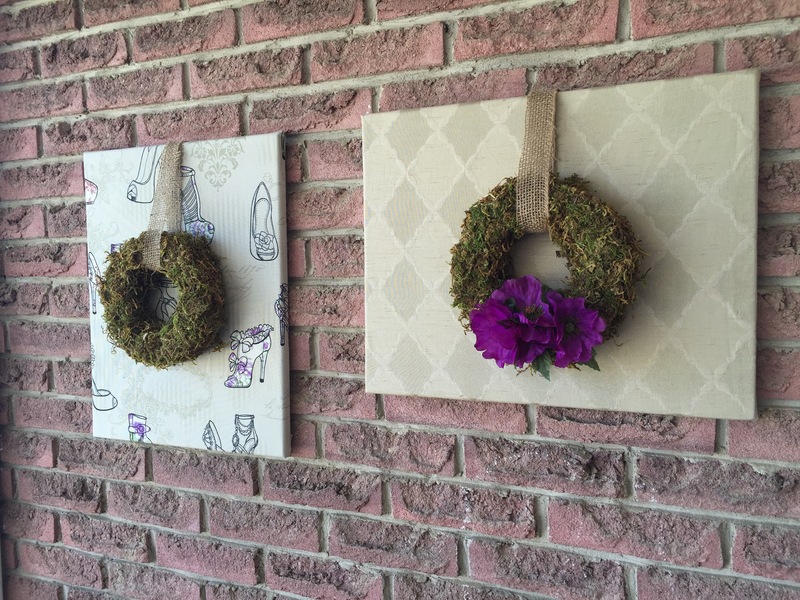 Here are the completed canvases, after I glued the moss to the floral foam rings. I used the same process for adding the moss to the ring as I did in this post. 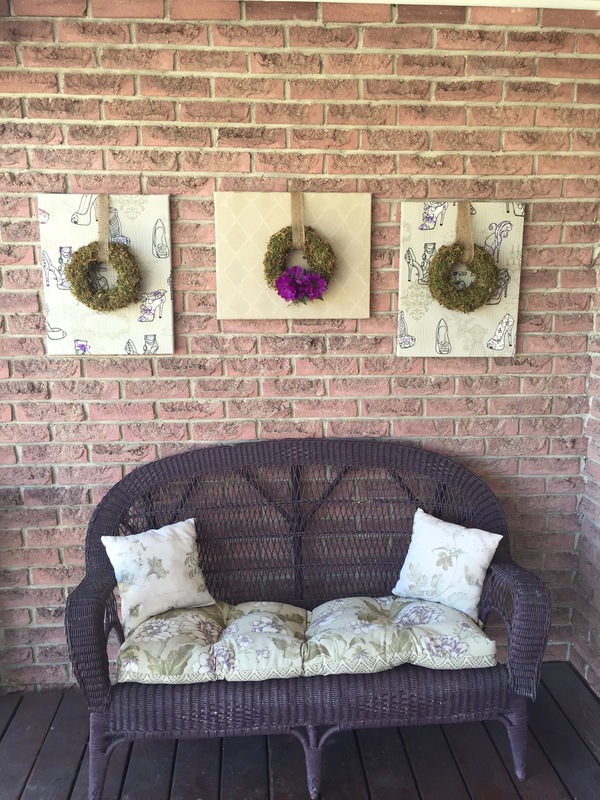 I then attached my new moss wreaths using a burlap ribbon, and a thumb tack pushed into the back of the wooden canvas frame. Here is a close up of the centre wreath. 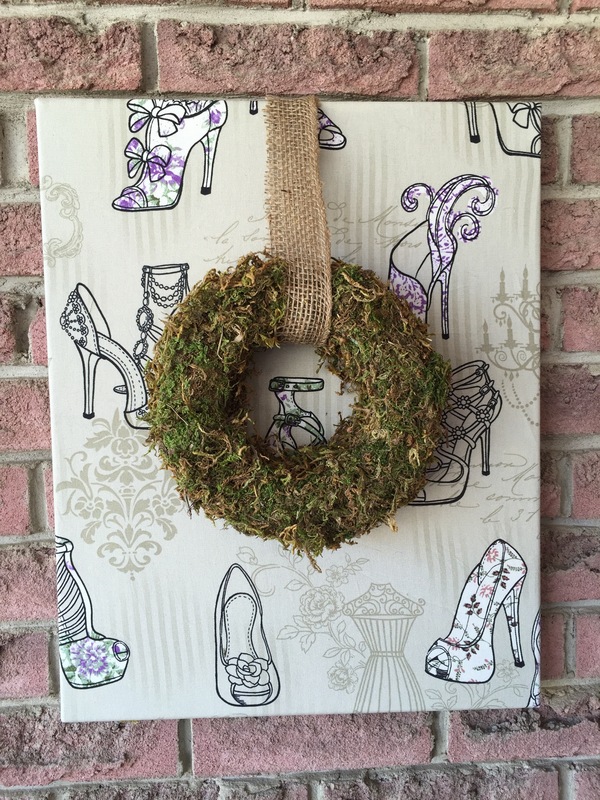 I added the purple flowers to this one, so that it tied in with the rest of the decor. I also like the stylized diamond pattern in this fabric. Here’s that adorable shoe fabric again. I love how it turned out, and it makes me smile whenever I walk in or out of the front door. I suppose it also gives guests something to look at while they are waiting for me to answer the door. Lol.